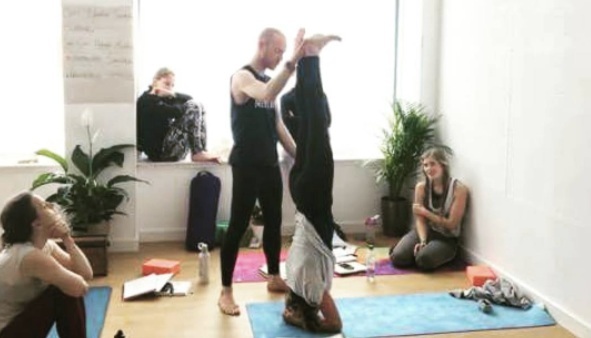 Our 500 hour programme is designed for beginners and qualified yoga teachers and provides the opportunity for participants to study with a senior teacher at the top of their field. Building gradually, and working with your busy schedule in life, start with a qualification of just 200 hours and grow as much as you like. Our flexible structure provides time and space for profound learning and growth, small group sizes and a supportive community of peers and tutors in beautiful Edinburgh. Whatever way you choose, each module is content rich. We encourage the repetition of modules so you deepen your understanding and knowledge, as well as increase your ability to apply the information. This training program provides a complete platform for those who are ready to teach, those who are already teaching, and those who want to gain more clarity into their life’s purpose, cultivating harmony both within and without. Lead trainer Dhugal Meachem’s trainings are an eclectic, well-curated mix of earnest practice and uber-relevant yoga philosophy. It is an experiential and educational deep dive into yoga and its practice. What we know and what we live is what unites us all, wherever we go after. The six modules build to a potential 500 hours (or more! ), the highest Yoga Alliance qualification. According to Yoga Alliance requirements, you need 200 hours to begin to teach—but that’s just the start. Yoga is a massively rich subject matter. We want you to know and want you to live more. You may start by doing either the two Hatha modules or the two Yin modules. Whichever way you choose, each module is content rich. We encourage the repetition of modules so you deepen your understanding and knowledge, as well as increase your ability to apply the information. Completing these modules will prepare you as a 200-hour and/or 500-hour Registered Yoga Teacher under the Yoga Alliance system. Dhugal is keenly aware that so much study can become a financial burden to teachers and serious yogis, and so continuously endeavours to keep his fees reasonable (and payment methods flexible). This, however, does not compromise quality. Ever. Dhugal himself has thousands of hours of training, and continues to study with his teachers on a regular basis. This is where most (but not all) start. Start each day with a creative practice. Grow your asana and anatomy knowledge. Anatomy is a large part of this module. We focus mainly on muscles, but also create a foundation for bone discussions. We dive deep into the complexity of yoga poses and the first yoga vinyasas (flows of poses). We also begin to find our teaching voices, and kick off an appreciation of Sanskrit. Course attendees will discover incredible resolve, power, and potential within themselves. Dhugal's trainings are designed to open the door to an aspect of yourself you may not have met, or even be aware of. Building on Hatha 1, we now explore the big visions of the ancient yogis through the lens of yoga philosophy. We appreciate how these teachings are still incredibly relevant in our modern world. Based on our anatomy and philosophy know-how, we grow our teaching and practice skills. Most yoga teachers in the world stop here, at 200 hours. I want you to know more. What Students Say: “Your classes are a safe place to learn. Everyone has their different insecurities when joining a class setting. My biggest takeaway messages were: teaching to keep my students safe, giving encouragement, building them from their foundations, building their strength, adjusting with your words, moving a class with your words, not pushing students into poses before they’ve mastered the original pose, and talking to your students to work them through their practice. At the end of the day, it's about the students and them feeling like you’re with each one of them as they practice. You’re guiding them through their practice and you can feel their effort, delight, and challenges as they work through each pose. I feel that I give this to my students, just like you gave this to us as we would practice in your class." Whether or not you intend to teach Yin Yoga, the Yin program offers in-depth bones anatomy which is extremely relevant to any yoga teacher, no matter your chosen style. This module is all about bone shapes, or what we call variable anatomy. We all have the same bones (almost!) in our bodies, but we all have very different bone shapes...just look around you. This course trains your eye. We believe that in order to teach or practice yoga (or any physical movement discipline) optimally, we must at least appreciate, and even master this understanding. This knowledge is fundamental to a Yin practice where poses are held for a longer period of time. We begin here with the legs and hips. Yin 1 introduces longer meditation and mindfulness practices. Oh, and we do a lot of Yin Yoga. Many who say they didn't think they would like it end up loving it...just sayin'! We complete our study of variable anatomy and turn to the study of fascia, body science's new frontier. We draw on the expertise of both Chinese medicine (which has become a leader in fascia) and modern science. The health of this tissue is the gateway to fine-tuning and mastering our physical, emotional, and logical health. Throughout this module, we will investigate classical Taoist philosophy which, for thousands of years, gives ancient context to the practice of modern Yin. Having lived in Asia most of his life, Dhugal is uniquely equipped to guide study. Taoism's often humorous insights provide a zen-like backdrop to consider and reflect upon the pressures of life today. We intentionally practice a variety of Yin yoga disciplines, as we believe there is no one right way to practice Yin. The aim in studying a wide variety of knowledge and application is to allow students to find styles and methodologies of teaching and practice to suit different students, their unique aims, and even times of year that are as distinct and special as each individual, leaving our teachers confident with such a broad education upon graduation. The Vinyasa approach to yoga is wildly popular today. In this module we dive into multiple strategies and approaches for practicing Vinyasa yoga, all based around the art of sequencing. You’ll learn to design varying levels of class and practice, as we continue to explore Indian myth and philosophy. Oh, and we will Vinyasa quite a lot! What Students Say: “To me, you don't solve people’s problems but instead you make them take responsibility for their own bodies and their emotional control. It helps people to keep or to get back their agency (self-efficacy) and to regulate themselves. I like this factor in particular, because it is the opposite of how guru-ism works. You are not turning us into blind sheep because only you have all the answer to our problems and questions, but rather force us to take responsibility which opens up a chance to find out more about one’s own potential. You support this process by trying to be as objective as possible and giving us facts instead of opinions. You create a neutral space that isn't already filled with what is ‘right’ or ‘wrong.’ This is a rare thing nowadays"
Building on our 200-hour Yin program, this module explores advanced Yin yoga modalities. It is expected that students are increasingly comfortable in their bodies and minds, and able to (almost) self-practice. Together, we explore and build upon the Five-Phase (or Element) theory of Chinese medicine. We’ll also return to our philosophical studies, investigating the union between Indian Buddhism and Taoism, which gifted the world the mind-health treasure of Zen. What Students Say: “The biggest takeaway I experience from your classes is a really holistic attitude towards yoga practice—you introduce aspects of philosophy and spirituality, as well as detailed knowledge of anatomy and muscular engagement. It feels like a very well-rounded practice: it’s not all about sweating or all about meditation; there’s a good balance of it all! In total, the programme comprises a maximum of up to 500 hours of tuition, practice and study.